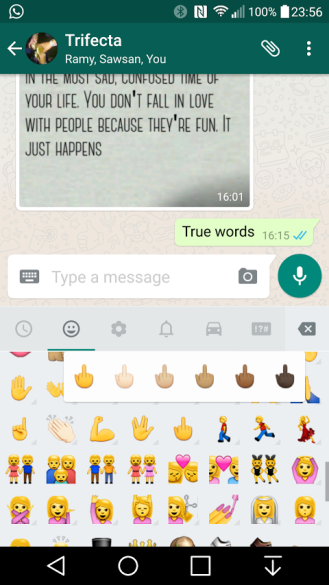 WhatsApp v 2.12.208 makes this middle finger emoji visible for everyone inside the app so you no longer have to jump through hoops to use it. It's even skin tone modifiable. It's flippin' ridiculous that you can't flip someone when they flippin' annoy you on WhatsApp, isn't it? You can fist-bump, high-five, wave, thumbs up, thumbs down, and even vulcan (Spock) salute, but you can't send one of the most (rudely) common and universal hand gestures ever... Or can you? Well, somewhere among the deluge of updates that WhatsApp has gone through in its beta iterations over the past couple of days, a new emoji snuck in. 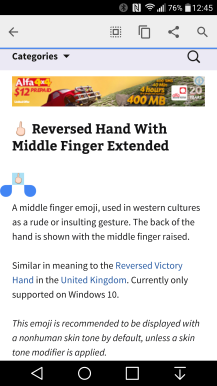 It's the middle finger, more technically known as the "reversed hand with middle finger extended (U+1F595)." Flippin' sweet name! 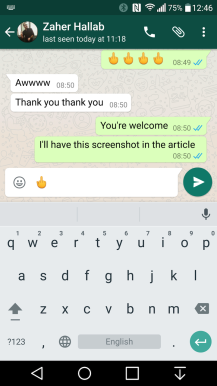 The emoji appears to have been discovered in WhatsApp's files by Stephen Wilkinson and reported by Metro, then our reader Martijn tipped us to let us know how it all works because, unlike the Spock gesture that officially showed up in the list of emojis in WhatsApp, this one is hidden unless you paste it in a conversation. 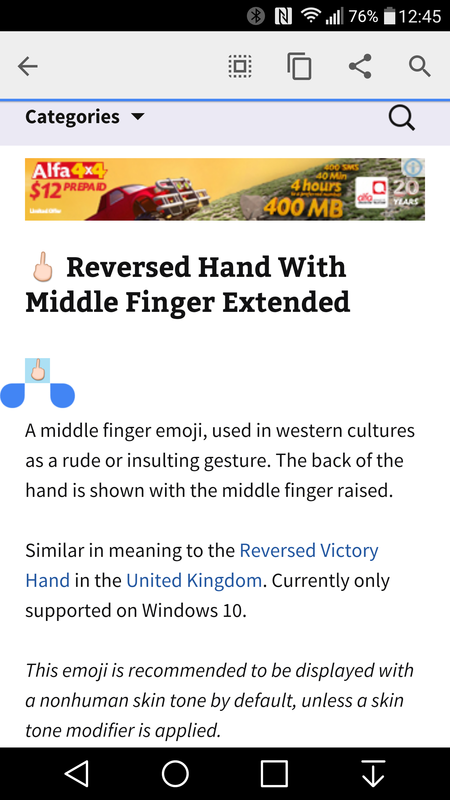 To do so, you'll need to copy the emoji from somewhere first and that can be done on this middle finger emojipedia page, this graphemica page (try this one if you have a Nexus device), or by copying the content of this parenthesis (). On stock Android, you'll see an empty box, but other manufacturer ROMs (like my LG G4) will display it accurately. 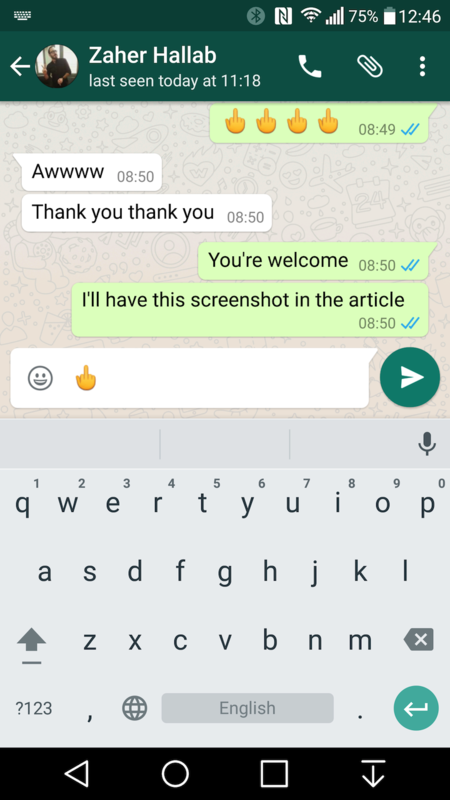 In either case, simply select the emoji or empty box and copy it, then head over to any WhatsApp conversation and paste it. Et voila. Ain't it flippin' awesome?! 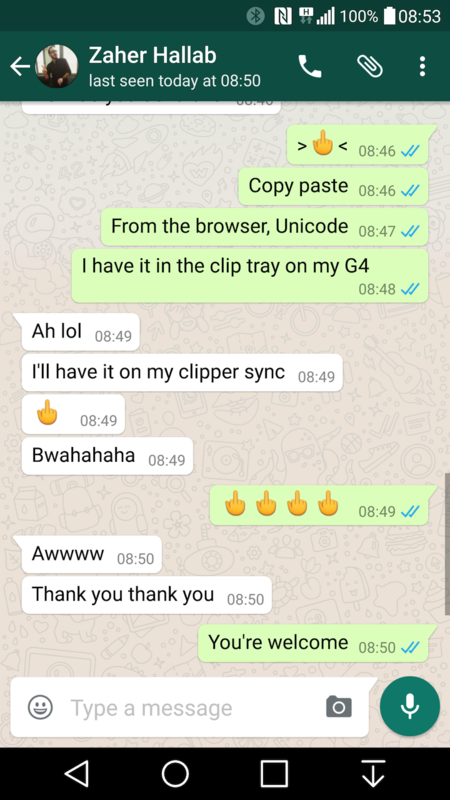 I've only verified this to work on WhatsApp versions 2.12.194 and 2.12.197, on both the recipient's and sender's ends, but it should also be there in all consecutive versions that you can grab from APK Mirror. However, those who have the Play Store v 2.12.176 of WhatsApp won't be able to see the emoji so you'll have to wait until everyone is on a newer build to be able to flip them all. What a flippin' shame! WhatsApp v 2.12.208 makes this middle finger emoji visible for everyone inside the app so you no longer have to jump through hoops to use it. It's even skin tone modifiable. Also, sometime along the last couple of beta updates, the app has added two LGBT-friendly emojis: the two boys and the two girls holding hands. Thanks: Pascal Mahler, Fabian La Rose. 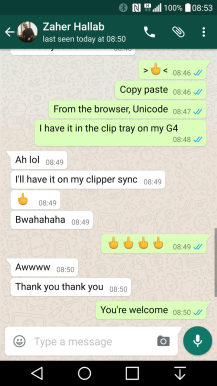 Middle finger emoji, with LGBT emojis on the row below it.